Following Monday’s disappointing judgment by Sir Wyn Williams refusing us permission for judicial review, CPRW supporters will be very pleased to hear that, after consultation with our legal team Richard Buxton Solicitors and Cornerstone Barristers, and with their generous support, we have today decided to seek to appeal the decision. Planning Policy Wales fully acknowledges the importance of wind-farms and sets out very clear criteria for their location. It states that only in EXCEPTIONAL CIRCUMSTANCES can they be located near ancient monuments. It was for this reason that Powys County Council rejected the Hendy Developers’ application by 11-1, and that the Inspector rejected the Developers’ appeal in May last year. It did not seem tenable to us that after twenty years of national and local debates about the location of wind farms in sensitive landscapes, the Welsh Government’s Lesley Griffiths could decide that exceptional circumstances existed to allow this wind farm – and without explaining why. CPRW nationally and locally are NOT opposed to wind-farms in principle. They are a vital alternative energy source and as such a counter to climate change. Powys is already a huge net energy exporter. But they should not and cannot be located haphazardly all over sensitive landscapes, and we are resolved to fight to the last to prevent this happening. The fact that the Developers immediately proceeded with unauthorised work, without fulfilling any of the conditions set out in the permission and with reckless haste, serves only to confirm their indifference to the environment and the local community. For the record, the development company is owned by U&I Ltd, London-based speculative property developers. Thanks to the many local residents and community groups who have supported us, we will be able to continue the humble struggle for our wonderful landscape in the Courts. Even if we do not succeed, we consider we must make the effort to go to appeal. We have been informed today by Cardiff Court that we have failed to get permission to proceed with the appeal against Lesley Griffiths’ decision. An appeal against this decision will cost us more money than we can afford, and looks unlikely to succeed. I know this will be a huge disappointment to all our supporters and to the many of you who have contributed to the cause, to the many that worked hard on the case and turned out in all weathers on Llandegley Rhos. There is some comfort to be drawn from the fact that we have shown that imperious decisions like this will not go unchallenged; that onshore wind farms located insensitively generate a lot of local opposition and a lot of bad press as well as a full on legal fight; that the regulator has been thoroughly apprised of the unauthorised nature of the works that were rushed through to gain accreditation, and the popular anger felt by taxpayers as a result. So all has not been lost. In the light of the above, and with the ceasing of the on shore subsidy system, it seems much less likely that there will be a repeat of such a farce. Thank you to all those who have supported us: we can only apologise that we could not prevail. As you are well aware, the Hendy developers pushed ahead with the development without fulfilling any of the required conditions, almost as soon as permission was granted by the Minister, Lesley Griffiths. We appealed that decision, and nearly all of you have helped us raise the money to finance that appeal. Grounds for appeal were lodged by mid December. However it became clear that the developers were going to have installed the first turbine before the appeal was even heard. We were therefore diverted in to a fight to halt the works. Powys County Council ruled that the works were unauthorised on December 6th, but did nothing to enforce a halt. We were successful in obtaining an urgent injunction to halt the works in Cardiff Crown Court. But at the Birmingham hearing on 20th December, our injunction to stop the unauthorised work was lifted. Despite a lot of press coverage and local protest, the first turbine was erected just in time for the development to attempt to qualify for an Ofgem Subsidised Tariff. With this tariff in place the development will be worth a lot of money. As you would expect, we have advised Ofgem of the unlawful nature of the development and questioned whether this is really what tax payers’ money is supposed to be for. We were glad to see the case made it in to Private Eye last week (issue 1490). Meanwhile, the appeal process is grinding on. We have to get leave to appeal, and were asked to attend a Permission Hearing in Cardiff on the 25th February, to decide this. Although this is supposed to be an ‘ex parte’ hearing, it was contested by QCs representing both the developer and the Government. Sir Wynn Williams the presiding Judge unexpectedly ruled that he was ‘reserving judgement’ so at this stage, some two week after the hearing we are in limbo as to whether the appeal will proceed or no. Thanks to all who have contributed towards this legal fight, and to all those locals who have made their voices heard on the embattled Common, in order to prevent a precedent being set that threatens anywhere in Wales with a ministerial diktat. The Welsh Soils Discussion Group are pleased to announce the Spring Meeting: Soil – the Essentials, in Aberystwyth on Wednesday 3 April (2019). The day will provide an introduction to soils and the issues surrounding around them. We have a range of specialists to deliver the training and help in discussions. The day is aimed at persons for whom (a) soil is a part of their job but not a major component or (b) people with a general interest in soil. The aim is to provide a baseline level of knowledge, network and encourage discussion. We would really like you to join us for an interesting and enjoyable day (see full details in the link below). So please sign up and save the date! Please can you make sure you follow that link to register online – it won’t take you long, its free for members, £10 for non-members. We need to know numbers expected, for health and safety reasons and also to make sure we have adequate refreshments! We are seeking CPD points for the day and will let you know how many once confirmed. CPRW Brecon & Radnor branch were successful in gaining an Injunction against further concreting works on Monday December 17th from the Cardiff High Court. We were bitterly disappointed to see this discharged yesterday 20th December in the Birmingham Civil Justice Centre. However the ‘pour’ has now been postponed until January 3rd as the Breedon Quarry is closed. We are actively considering issuing a Judicial Review if Powys County Council agree that the pour can proceed. Central CPRW are fully behind such action and their instant response (to an urgent telephone call from the court yesterday!) has been magnificent. Meanwhile the main action, the Section 288 Appeal against Lesley Griffiths’ incomprehensible decision to ignore Powys County Council, the just-approved Powys LDP, and the Inspector’s recommendation to reject the Developer’s appeal, will proceed at all possible speed. The legal actions are consuming huge amounts of our time, but more worryingly huge amounts of money. Please continue to give generously to save the Llandegley Rhos! Many thanks, and Best Wishes to all at this Christmas Festival Season. Appeal Account Details: EVERY LITTLE HELPS! CPRW Is a Registered Charity No 239899 – If you are a UK taxpayer, please consider filling out the gift aid form HERE. This will add 25% to your donation at no cost to you. If paying by cheque, please make it out to “CPRW – Brecon & Radnor”. Cheques and gift aid forms should be sent to Ann Payne, Glanffrwd, Llanfihangel Talyllin, Brecon, LD3 7TL. On Friday 14th December CPRW B&R have issued to the courts in Cardiff an urgent claim for interim stay which, if successful, will require the developer to cease all work on site until the s288 challenge to the Minister’s decision is heard by the courts. We are hoping to have a decision on this by the middle of next week and we will advise as soon as we have news. Contravention of an order for interim relief is contempt of court for which the defendant can be imprisoned, fined or have assets sequestrated. Holly Ann Hobbs has just announced late Friday afternoon that while the developer is permitted to install steel rods, a Temporary Stop Notice will be issued if he attempts any further work beyond the installation of the rods, such as the concrete pour. We are disappointed that the Temporary Stop Notice has not been issued with immediate effect and unable to understand why this developer has been offered any further concessions at all. We will have to remain very vigilant. This developer has already demonstrated his contempt for planning law and is unlikely to change his behaviour now. As you are all well aware, and many of you have already generously contributed towards the fund for legal fees for this action, CPRW B&R served papers on 6 December on Welsh Government and Interested Parties for a Section 288 Review of the Minister, Lesley Griffiths’, incomprehensible decision to allow the Hendy Wind Farm development. As you are also well aware this challenge is being overtaken by events. The construction work at Hendy/Llandegley Rhos began on 20th November immediately after submission of applications to discharge conditions, and continues at breakneck speed, at nights and at weekends, with no regard for permitted hours of work. The developers are evidently determined to erect one turbine before the end of January in order, it seems, to be eligible for government subsidy. Works have taken place on the Llandegley Rhos common and more are proposed for which no planning consent has been applied for or obtained. Construction teams have been pile driving on the wind farm site and concrete is now arriving on site for the first turbine base. This work is being carried out without any of the pre-commencement planning conditions being discharged. These conditions are all binding and the Minister’s consent is contingent upon the conditions being satisfied in full and discharged. While heroic demonstrators at the site have done their best to delay these works on common land, we have made repeated representations to Powys County Council to enforce a halt to these illegal works without any tangible result. On 6th December Powys informed residents that the developer had been ‘advised to stop’ but that no enforcement notice had been issued. Since then the council have professed themselves unable to get ‘evidence of unacceptable harm’ – which Planning Officers maintain to be a requirement for enforcement action. We have set out that the Council has applied the wrong tests re enforcement action and has misinterpreted material points of law to reach their decision not to enforce against construction works, which are of themselves unlawful because they have not followed approved plans, and are being undertaken without discharge of pre-commencement conditions. We have this morning served on the Council a pre-action protocol letter, addressing the legalities of the Council’s position on enforcement. In it we demand that effective enforcement action is undertaken by the end of this week or that we will forthwith issue proceedings against them for a judicial review of the enforcement function. It seems that the developers, Powys County Council and the Welsh Government consider they have no need to heed or uphold the law. With your help we are going to make them feel the full force of it. For urgent action! Please pass on this urgent message on, and don’t forget to write in yourself! Thank you. This just came to our attention last night: Lesley Giffiths’ decision to approve the Hendy Wind Farm is to be challenged by an amendment in Welsh Assembly Plenary session next Tuesday (20 November). This just underlines the importance of her decision to flout the Planning System and Local Democracy. See how you can help below. Engaged a barrister and landscape consultant and provided our own witnesses throughout the two weeks of the Inspector’s Public Inquiry. The Planning Inspector recommended the Appeal against refusal of the Hendy Wind Farm be dismissed because the landscape and ancient monuments of Llandegley Rhos outweighed any benefits of the 7 turbine Wind Farm. Lesley Griffiths, Minister of Energy, Planning and Rural Affairs summarily over-ruled him. If this decision stands, no Welsh landscape outside National Parks and Designated Areas is safe from large-scale industrialisation however much it is valued by Welsh people. Please help CPRW do all we can to stop it. All this has cost a huge amount of time, energy and emotional resource for us and our many supporters. The planning process has also cost the public purse dearly. Please tell our politicians what you think and ask for their support. On Tuesday 20th November there is an opportunity to put pressure on the Welsh Government concerning Lesley Griffith’s decision to overrule the Planning Inspector’s dismissal of the Hendy Wind Farm Appeal following the vote by Powys County Council Planning Committee to refuse the application in September 2017. The Senedd is holding a Plenary session on Tuesday 20th November at 13.30pm. Item No. 9 is a 60 min debate: ‘How to achieve a low carbon energy system for Wales’. Ask her to vote for this amendment in the Senedd on Tuesday and to stand by her original objection to the Hendy Windfarm development. Her vote is key in this matter. She is keeping the balance of power for the minority Labour government, who will be whipping their members on this amendment. Kirsty has the opportunity either to vote in the interests of her constituents and to stand up for local democracy and the legitimacy of the Powys LDP, or to take the Labour Party whip to support Lesley Griffith’s unprecedented decision, which as it stands, creates open season on development anywhere in Wales by setting the precedent of overruling both the Planning Inspectorate and local planning policy thereby undermining the democratic process of the planning system. 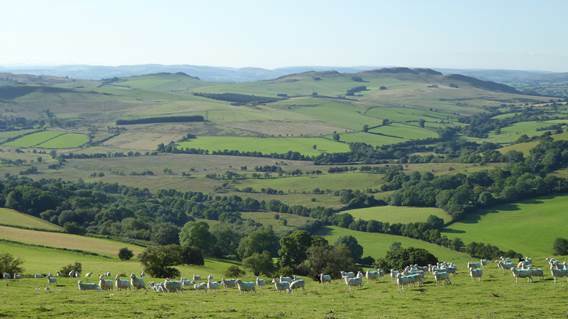 You could also write to AMs in other parts of Wales – this decision sets a precedent for the whole Welsh Countryside. Welsh Government Cabinet Minister for Energy, Planning and Rural Affairs, Lesley Griffiths, has approved Hendy Wind Farm at Llandegley Rhos. In her decision released on 25/10/18, she has chosen to disagree with her appointed Planning Inspector, Hywel Wyn Jones, whose report following the March 2018 Public Inquiry was delivered on 11/5/18. No attempt had been made to justify the rejection of the Inspector’s findings beyond the need to serve the ‘national interest’. This is a disgraceful decision and your committee will shortly inform you of our collective response. We will fight on, including considering legal options. I am very sorry to have to give you this dire and troubling news. 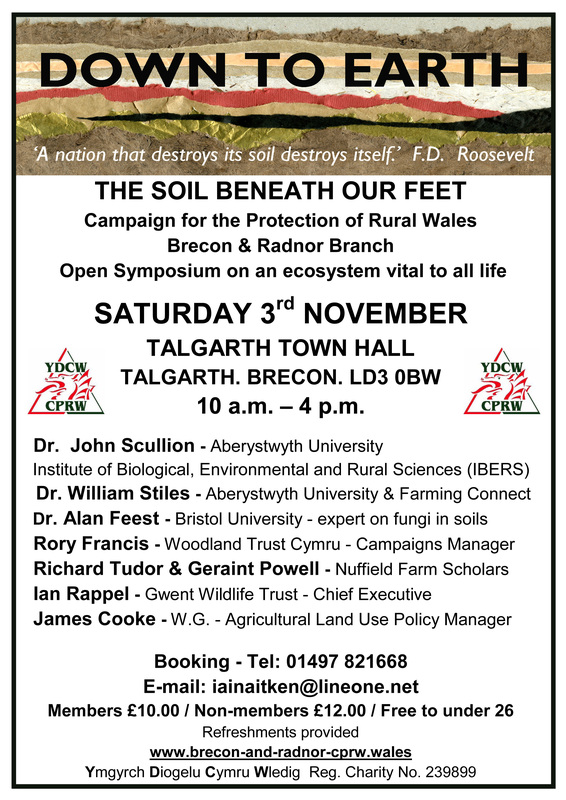 Yes, the answer does lie in the soil and if you’ve ever wondered what those answers are the Brecon & Radnor Branch of the Campaign for the Protection of Rural Wales are hosting an inspiring day of talks and discussions on Saturday 3rd November at The Town Hall in Talgarth near Brecon from 10.00am to 4.00pm. Richard Tudor and Geraint Powell, both Nuffield Farm Scholars and well-known practising farmers. Fundamental to life on Earth, our soil is a non-renewable resource, and home to a quarter of all living species on Earth. But life within the soil is so often ‘out of sight, out of mind’. What organisms make up our soil and how important are they to life above ground? How are our activities affecting soil ecology and biodiversity? Charles Darwin spent over forty years studying the earthworm and its effect on our soils, yet today only about twenty five percent of worm species, six percent of fungi and less than two percent of soil bacteria have been studied and categorized. ‘Down to Earth’ Soil Symposium Day offers a fascinating and unique opportunity to share questions and answers in the company of a pre-eminent panel of speakers, and to discover more about our soils and how we can look after them, as we face the future challenges of the 21st century. For your satnavs the postcode for Talgarth Town Hall is LD3 0BW. Location map here. There is a large free car park just a couple of minutes walk away, shown on the map. A colour poster promoting the symposium is available for download here. We look forward to seeing you there in Talgarth on Saturday 3rd November at the Symposium! If you have ideas, information, expertise and can help the committee with our work, we would really like to hear from you. And if you are a Welsh speaker and have time to help us with translations for the website please do get in touch. Want to keep in touch with our news? Enter your name and email address below to subscribe to our News and our Newsletter. (If you can't find the confirmation email please check your Spam folder!) You will then be sent an email containing a link for you click to confirm your subscription, and thereby to consent to us storing your name and email address solely for the purpose of sending you our occasional News updates. © 2019 | Powered by WordPress | Theme: Nisarg by Falguni Desai.